What we have in The Hexer is a whole new class of film and/or entertainment. It’s not often that you get to see the birth of a new genre. Sadly, I missed this one’s debut by five years, as it first appeared in 2001. Oh well, better late than never. Today’s DVD release may be this film’s first appearance in the English-speaking world, so now is the time for all of you Anglophones to jump on this fantasy bandwagon before it gets rolling too fast. The Hexer is the first Polish sword-and-sorcery fantasy film I’ve ever seen, and I like it. But what I like about the film needs some explanation, which goes something like this: The Hexer is to Lord of The Rings as Sergio Leone’s A Fistful of Dollars is to John Ford’s The Searchers. In short, it’s a Polish spaghetti western, except that it’s not spaghetti but maybe... cabbage?, and it’s not a western but Dungeons and Dragons. What to call it? Kielbasa Sorcery? Warsaw Wizards? Coming up with a name for this is going to take some more work. Apparently, Hexer is reviled in its native Poland. It was a TV show and then mushed into a movie and has met with unfavorable reviews at home. When you look at like-minded US fantasy or sci-fi endeavors, there is a long list of so-called failures that are actually well made and lively productions with avid fan bases. Firefly comes to mind. So maybe bad reviews don’t mean that much. So what is it that they’ve got? Granted, stories about dragons, dwarfs, wizards and elves really aren’t the heaviest of literature, no matter what your language or country of origin. That said, the genre can still be done in an engaging way. The oddly Californian Hercules and Xena TV series in the States are what I suspect Hexer director Marek Brodzki had in mind when he started. What he and cinematographer Bodgan Stachurski ended up with is something that is quite good, maybe even better than the American TV shows. The locations and photography are wonderful, and the dungeons in this film are the real deal. Hexer is based on a popular series of novels by Andrzej Sapkowski who also is credited with some writing for the film/series. Translations of his novels have been made into other European languages and there is supposed to be an English language version coming out in 2007. I’d like to read it myself to see if the story line has anything to do with the film. A hexer (a.k.a. wiedzmin) is a guy that’s been trained from early age to be a master warrior, a wizard, an emotionless killer of monsters and defender of those who need defending. He’s a magic-throwing, dragon-slaying Polish samurai. Geralt the White Wolf (Michal Zebrowski) is our fair-haired handyman with the sword who looks like an outsized version of Legolas. Geralt has some mannerisms of Clint Eastwood’s stoic characters, but who he really looks and acts like is Toshirô Mifune’s samurai from Yojimbo. Geralt even carries his sword strapped to the middle of his back in a rakish gunslinger/ninja style. There is an odd convergence of genres here because most of Leone’s spaghetti westerns were direct lifts from Kurosawa’s samurai films. So it’s not surprising that Geralt is at the same time samurai, knight errant, and hired killer. And to further gild the lily, he can cast a bolt of magic like Harry Potter. Do not tug on this guy’s cape. The Hexer was done as a TV series and as a consequence the film’s story line is pretty fractured. Nominally, our hero is out to rescue an eight-year-old princess, but he takes regular side trips to slay some monster or another. I quickly lost track of the other characters who flow around Geralt like a river. This is too bad because they all seem to be pretty interesting. Just when you start to enjoy them, they disappear over a cliff or down the road. It is in the monster FX department that Hexer suffers the most. Like a spot of egg on an immaculate tuxedo, the inferior FX spoil what would otherwise be a stunning piece of filmmaking. The CGI dragon is simply sad. On the other hand, there is a knight who must wear an oddly spiked helmet to hide his witchcraft-induced facial deformity (he sort of looks like wolf-man). He’s creepy with the helmet on, suitably bizarre with it off, and all within budget and appropriate to the dramatic scale. What I’d like to see is someone like the Sci-Fi Channel pick up the TV version of the Hexer and bring it to the States. It would be cool if they left it subtitled, but I realize that’s not allowed on American TV, which is too bad, because I like the sound of the spoken Polish set to the mediaeval visuals. Still, our hypothetical import would probably have to be dubbed, but it might still be better than some of the cockamamie in-house monster ‘movies’ that the Sci-Fi Channel has been showing lately. Visually, The Hexer is a treat. It has wonderful visuals, sets and photography. The soundtrack is a little sparse. Some plainchant might have added a little extra atmosphere. Check your high-handed Lord of the Rings elitism and ILM sophistication at the door, and enjoy this one for the characters and scenery. For further adventure, try to make sense of the story. Miss. PJ: I loved the movie. It is best with sub-titles. Michal Zebrowski is great. While the movie is a bit slow, the story line is great(IF-you have the ability to follow it.) It is beautiful and sad. I hope they do make a part 2. I will buy the Polish version. Co-producer of this movie is a polish public TV. Their policy is to sell same material twice: as a cinema movie and as a tv series. 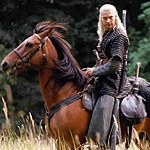 The Witcher (aka hexer) is as important for polish fantasy, as Lord of the Rings for english-speaking culture. Firstly it was a set of novels, printed in two sets; then it was full saga with five volumes. Movie/series tells the story taken from novels only. Novels are cool, but the saga is a real thing. Sapkowski's fans thought, that movie will be based on full story, and they didn't got it - that's why they didn't liked it at all. Not mentioning bad CGI, editing, casting and so on.